It has been over half a year since I last went to a football game. If you have been following this blog for a while, you know that I enjoy watching sports. I have been to several baseball games, football games, and of course F1 and Moto GP. I love to watch sports in Japan because it is a good reason to go crazy, drink a lot, and just cut loose from the daily routine. It had been almost 2 years since I had last been to an FC Tokyo game. Last year I didn’t have the opportunity to go to a game as I didn’t have anyone to accompany me to the game. 2 years ago, for the FC Tokyo game, I went to Ajinomoto Stadium to see the Tokyo Derby when FC Tokyo spent a year relegated in the J2 league. The Tokyo Derby is when FC Tokyo and Tokyo Verdy play each other, and it was one of the last times they had the derby as Tokyo Verdy is usually stuck in J2 and FC Tokyo is often in J1. The main reason I wasn’t able to go to an FC Tokyo game in the past 2 years was partly due to time but also because I had no one who wanted to go to a game with me. I did go to an Urawa Reds game last year as one of my friend’s is a huge supporter of the Reds, but it isn’t the same. The Urawa Reds are a great team and by all means they are a better team than FC Tokyo. I love to visit Saitama Stadium as the games are exciting and the stadium itself is very loud but Ajinomoto is a very different beast and by no means uninteresting either. 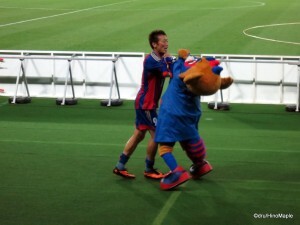 The FC Tokyo VS Ventforet Kofu game was held on Wednesday July 17th at night. I had finally gotten a friend interested in going to a game with me. Being a night game, I decided to meet up with my friend a little early in Shinjuku and head out before the afternoon rush really started. The trains were pretty busy and packed but it wasn’t terrible either. We quickly got to Tobitakyu Station, the closest to Ajinomoto Stadium, and ate dinner near the station. As always I picked up my tickets at the stadium as you never know if it will rain. If you want to save money, it is cheaper to get them ahead of time, but I always prefer the flexibility of getting tickets at the last second and they rarely sell out. If you are heading to the stadium from Tobitakyu Station, once you get near the gates, head right and you’ll see the ticket booths about 50 metres away. Sometimes they even have a special tent to help sell the free seating tickets when the lines are long. I recommend getting the free seating and getting there at least an hour before the game. It allows you to see the players warm up and experience all of the activities the crowd does before the game. There is the traditional roll call for the team players, and of course at every FC Tokyo game, they sing “You’ll Never Walk Alone” as is the tradition of FC Tokyo. For the FC Tokyo VS Ventforet Kofu game, the weather was not great. It was lightly raining for almost the entire game. Due to the rain, I think they discounted the beer at the concessions stands as the beer was at a very cheap 350 Yen rather than the regular 610. It was a great steal and I was happy to buy a lot of beers. The only problem I had was that I wasn’t feeling like drinking many beers, so I just drank only one. I also picked up a cool FC Tokyo towel scarf. 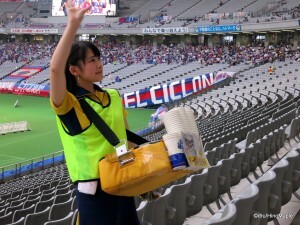 These are popular at all football games in Japan. Every team has them and you can find them at all of the official goods shops around the stadium. FC Tokyo was the first team I had watched in Japan, and I had become a fan of their team over time. While my friend bought one of their scarfs last time we went, I didn’t. This time I felt a need to support the team, but I still haven’t gotten to the point of buying a jersey yet. I don’t know the team players very well and I feel it is inappropriate to support a team that I don’t know very well, or even follow a lot. I would love to get a jersey but I am just not at that point yet. The game itself started at 7:30pm and continued for the standard 2 hours. The game started off terribly. Within the first 30 seconds, Kofu made a lucky play to get a goal on FC Tokyo’s goal keeper, Gonda. They capitalized on a sleeping FC Tokyo defense to keep a ball in play and at the same time they got lucky with a blind pass to a teammate in the slot. It was shocking to see a goal so quick in the game and my friend, who was watching his first ever football game, was also surprised. 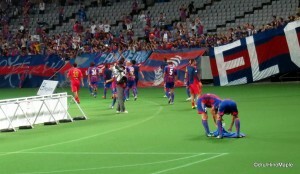 One of his comments was that he was surprised that the FC Tokyo fans were still going strong to support their team. What he didn’t know was that the supporters were very loyal and wouldn’t give up till the end. When you watch the National Team play anywhere in the world, you’ll see the Japanese fans pounding away at their drums and cheering almost continuously. I would say the cheering worked as by the end of the first half, FC Tokyo had tied the game and the fans had no intention of relenting. By the time the second half had started, the rain was still falling and varying in intensity. While it never poured down, it was lightly falling and no one dared to venture from the covered areas of the stadium. In the lower bowl, only the top third of the seats were covered and the bottom two thirds were exposed to the rain. Since we had rain coats, we decided to head down to the front row of the stadium a few minutes into the game. It was my very first time to experience a game in the front row. I am usually around half way up due to the number of fans at the stadium. The front row is almost always taken up before I even get a chance to enter. I must say that the experience is completely different. I have been to many points within Ajinomoto stadium and the worst place to be is behind the opposing team’s goal as you can’t hear the cheering home team crowds as much as the visiting team crowds. 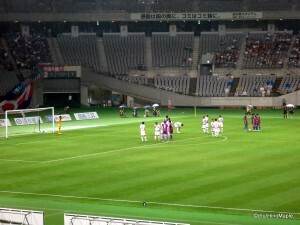 This time I had a chance to be in two places during the game as the crowd was pretty small by FC Tokyo standards. At first, I was about two thirds up and being higher up was great to see more of the field and to see what was happening with the plays. In the early part of the second half, I moved to the front row and sitting in the front row meant that I could enjoy the game up close and see the players a lot better. I was surprised by the change in acoustics when comparing a higher seat to the front row seats. The crowds seemed a lot louder and I was getting into the game a lot more than in the higher seats. This could also be due to the fact that FC Tokyo scored 3 goals in the second half to win 4-1 against Kofu. I couldn’t help but jump for joy every time FC Tokyo scored, be it closer to the top or in the front row. Towards the end of the tame, the rain stopped and more people came down to watch the game. It was crazy for such a small crowd (12,000) at the game and towards the last few minutes, the majority of the stadium started to sing “You’ll Never Walk Alone” as it was nearly a foregone conclusion that FC Tokyo would win. 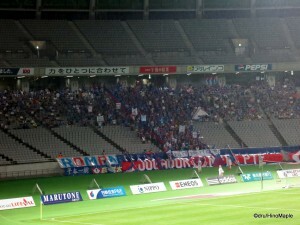 While FC Tokyo did go on to win, we can’t forget about the visiting team either. I have written a lot about FC Tokyo in the past, please see the links below, so I won’t go into any details about FC Tokyo here. Ventforet Kofu, however, is a relatively unknown team to people outside of Tokyo, and also people not familiar with the J League. Kofu is a small town in Yamanashi, near Mt. Fuji. Their name comes from the French words wind (vent) and forest (foret) since Kofu is located in a forested area and the name comes from a popular expression from the local Daimyo from back in the feudal days. I’m still not sure why they chose French as the language for their team name, but a lot of Japanese football teams don’t always make sense when choosing names. Kofu has had a lot of mixed fortunes in the past couple years. In 2010, with the help of Mike Havenaar, a Dutch descent player who was born and raised in Japan, they were promoted to the top league, J1. Even though he helped the team a lot, the team was relegated again for the 2012 season. 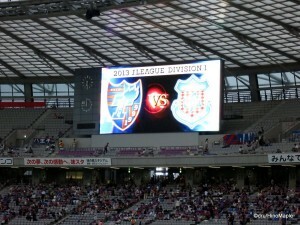 This year, they returned to J1 in what seems like a seesaw movement between the two divisions. They appear to be good overall but not good enough to stay in J1. They are currently in a tight battle to remain in the top division. As I am writing this, there are 4 teams battling closely to stay in J1 with two of those teams to be relegated to J2. Only time will tell if they are relegated or not. 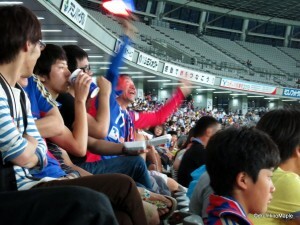 Going to an FC Tokyo game is a lot of fun for me, especially since I support the team. I have been supporting them since I came to Japan, albeit not seriously until recently, and even then I am not a serious supporter. I hope they never get relegated to J2 again but they seem destined to be a mid-ranking team for the foreseeable future. Going to and FC Tokyo game is also difficult now that I am living on the east side as Ajinomoto Stadium is located in Chofu. In order to get to Ajinomoto Stadium, I have to cross Tokyo and then head out west to the stadium. It is inconvenient and a little expensive. Thankfully they play a game or two at the National Stadium in Jingu every year. It is a little difficult to find time to go there, but I am planning to head to their next game at the National Stadium in August. It may also be the last chance I get to go to the National Stadium as they will be rebuilding it from 2015. Whether you go to Ajinomoto Stadium or the National Stadium, hopefully you won’t be disappointed as FC Tokyo are a good team to watch with several good players on the team. The following is a playlist of a series of videos I took at the game. Most of them are of the songs sung by the fans and one intro song done by a Japanese idol group called Idoling. This entry was posted in Football (Soccer) and tagged Ajinomoto, Ajinomoto Stadium, Chofu, Dorompa, FC, FC Tokyo, Football, Football Club, footie, J-league, J1, J2, japan, Japan League, Kazuma Watanabe, Kofu, Shinjuku, Soccer, Tobitakyu, Tobitakyu Station, tokyo, Tokyo Dorompa, Ventfore, Ventforet Kofu, Yamanashi, You'll Never Walk Alone by Dru. Bookmark the permalink. I was going to ask why so many empty seats when I read your remark that it was a small crowd for Tokyo. They’re rebuilding the National Stadium? I assume it’s been on the cards for a long time, but I wonder whether the possibility of the Olympics played a part in this renovation. PPS: Ah well. We’ve got Sky Tree. Yeah. It was a small crowd and the rain played a big part too. The new stadium looks good. Don’t know if it will stand the test of time though, but it looks promising. Yes, it is a pain to get to Chofu, but it is the only way I’ll watch football. I could go to Chiba, but that is in J2. Also, the Reds and other teams are just as far.